Poultry is one of those meats that requires very careful handling to avoid foodborne illness. Use fresh poultry within two days of purchase or freeze immediately. Thaw poultry in the refrigerator or microwave, never on the counter. Wash all poultry before using and pat dry with paper towels. It is the skin that carries most of the dangerous microbes. Be sure to thoroughly wash all surfaces that have come in contact with the poultry, including sinks and cutting boards. Do not touch other foods after handling poultry without washing your hands and/or the utensils used. Refrigerate leftovers immediately and do not let them sit at room temperature more than 45 minutes. The standard method for preparing Buffalo-style wings is to deep-fry them, then dip in a mixture of melted butter and liquid hot sauce. 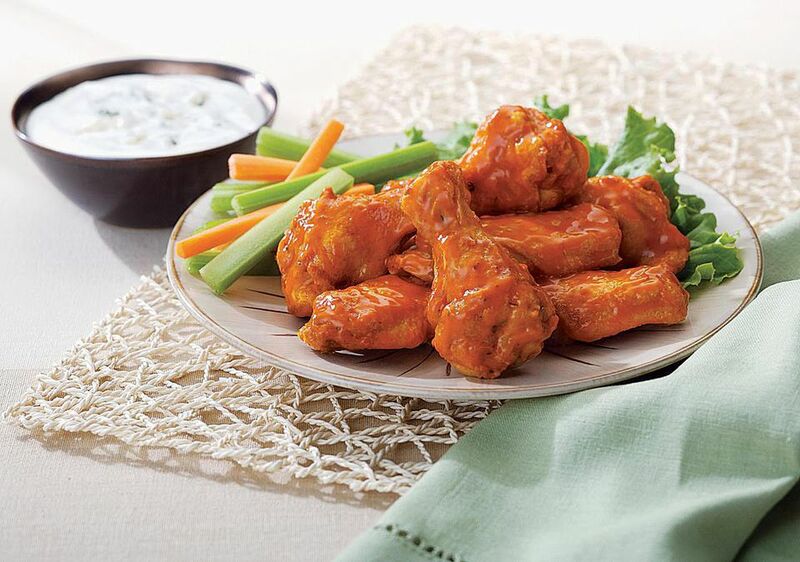 The specific red pepper sauce used is an issue that is hotly debated by wing fans. Some prefer Durkee (formerly Frank's Louisiana Hot Sauce), yet others swear by Crystal. Both of these hot sauces are readily available in most grocery stores. To be authentic, you'll need to accompany your hot wings with fresh, crisp celery and blue cheese dressing, both of which are said to help ease the heat of the hot wings. Plan on about five wings per pound, depending on size. Four to six wings per person makes an adequate serving. Keep in mind that the drummettes will take a little longer to cook than the double-bone joint and plan accordingly. Raw wings may be frozen up to nine months. Cooked wings may be frozen up to one month.